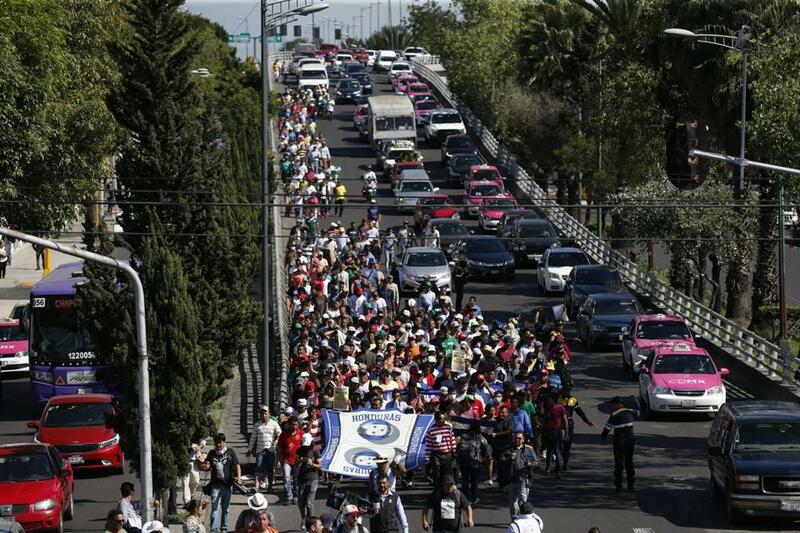 Central American migrants marched Thursday to the United Nations office in Mexico City to demand buses to the US border. WASHINGTON — The Trump administration, invoking national security powers meant to protect the United States against threats from abroad, announced new rules Thursday that give President Trump vast authority to deny asylum to virtually any migrant who crosses the border illegally. Administration officials declined to say who will be affected by the new rules, but it is widely expected inside the government and by advocate groups that Trump intends to deny asylum to migrants from Central American nations, some of whom are marching toward the United States in a widely publicized caravan. The president, who made immigration and the caravan major issues during the midterm election campaigns, is expected to announce Friday which countries the rules will apply to. They will go into effect on an emergency basis as soon as they are published in the Federal Register. The new regulations draw upon the same authority Trump used to ban travel from several predominantly Muslim countries only days after his inauguration and are certain to be challenged in court. Lawyers for immigration advocacy organizations said they violated a founding principle of federal asylum: to judge each person’s asylum claim on its own merits. And the lawyers said federal and international law made it clear that the United States must provide immigrants the opportunity to claim asylum regardless of whether they entered the country legally or illegally. An administration official who briefed reporters said the two programs would satisfy the United States’ treaty obligations — a claim critics say is not true. The official, who spoke on the condition of anonymity to provide details of the rules before they are published, said the new regulations were supported by laws that gave the president broad authority to control who entered the United States. Trump has fumed at his advisers for months about the surge of  illegal immigrants crossing into the United States from Mexico. Enraged by the caravan of several thousand migrants that began forming in Honduras and has been slowly making its way to the US-Mexico border, he ordered more than 5,000 active-duty troops to the border to prevent the migrants from crossing. Since taking office nearly two years ago, Trump has railed against what he calls weak laws that allow migrants who are caught crossing illegally to claim asylum under false pretenses and then be released into the United States, sometimes for years, as they wait for the courts to determine the validity of their asylum claim. Thursday’s asylum changes are part of a concerted, governmentwide effort by Trump and his hard-line aides, including Stephen Miller, the senior domestic policy adviser in the White House, to drastically reduce immigration by enacting broad changes to the nation’s laws. In addition to the travel ban, Trump has severely scaled back the number of refugees who may be allowed into the United States from around the world. And he has proposed rules that would punish legal immigrants by denying them green cards if they use public benefits like food stamps and housing vouchers.